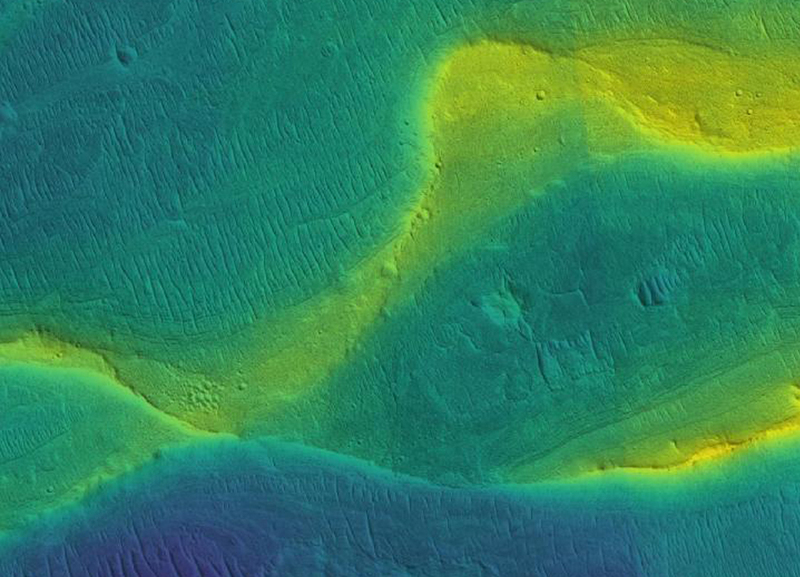 A photo of a preserved river channel on Mars, taken by an orbiting satellite, with color overlaid to show different elevations (blue is low, yellow is high). Scientists aren't sure, because their understanding of the Martian climate billions of years ago remains incomplete. A new study by University of Chicago scientists catalogued these rivers to conclude that significant river runoff persisted on Mars later into its history than previously thought. According to the study, published March 27 in Science Advances, the runoff was intense--rivers on Mars were wider than those on Earth today--and occurred at hundreds of locations on the red planet. Mars is crisscrossed with the distinctive tracks of long-dead rivers. NASA's spacecraft have taken photos of hundreds of these rivers from orbit, and when the Mars rover Curiosity landed in 2012, it sent back images of pebbles that were rounded--tumbled for a long time in the bottom of a river. It's a puzzle why ancient Mars had liquid water. Mars has an extremely thin atmosphere today, and early in the planet's history, it was also only receiving a third of the sunlight of present-day Earth, which shouldn't be enough heat to maintain liquid water "Indeed, even on ancient Mars, when it was wet enough for rivers some of the time, the rest of the data looks like Mars was extremely cold and dry most of the time," Kite said. The rivers also show strong flow up to the last geological minute before the wet climate dries up. "You would expect them to wane gradually over time, but that's not what we see," Kite said. The rivers get shorter--hundreds of kilometers rather than thousands--but discharge is still strong. "The wettest day of the year is still very wet." "Our work answers some existing questions but raises a new one. Which is wrong: the climate models, the atmosphere evolution models, or our basic understanding of inner solar system chronology?" he said.